Trying to figure out which exercise videos are the best can be a real challenge. Our information can help. With all of the choices available is very easy to get overwhelmed and frustrated when you’re trying to figure out which videos are going to give you the results you are looking for. We’ve done a lot of research on the internet and studied professional fitness individuals and have compiled an exercise videos review that will take the guesswork out of which videos are the best and will help you narrow down the choices and decide on videos that will help you reach your goals. Our objective is to use the information we have gotten and pass it on to you, all in one convenient place so you don’t have to go from site to site trying to find what you’re looking for. Exercise Videos and DVDs are a popular way people work out every day. There are a massive amount of exercise videos available that target all kinds of fitness goals. We have reviewed three of the top ten workout DVD/video sets that are being purchased by consumers and have detailed what they do, why people like them and what they are saying about them. With the information you’ll learn in this exercise video review, you won’t have to guess and just randomly choose a video not knowing if you’ll like it or not. You can study the information, read what others are saying and make a choice that will match what you are looking for. 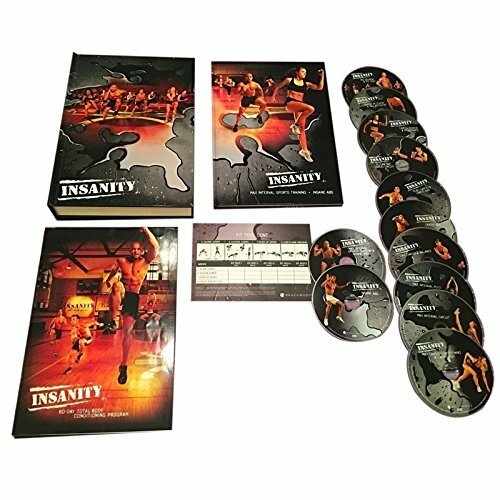 In 60 days you’re guaranteed to get incredible, noticeable results using Insanity Workout. The Max Interval Training techniques get you a muscled, lean body in a shorter amount of time than many other exercise videos can do. It isn’t an easy workout and if you’ve never exercised before, this may not be the exercise videos for you due to their high intensity and difficulty, but if you’re looking for an exercise program that really gives results; you’ll want to give this a try. Dig Deep and Fit Test – this is a 30 minute fitness test to see what you can handle. It will without a doubt, let you know where you are in terms of fitness. Plyometric Cardio Circuit – for the lower body, this 40 minute fat blaster will have you sweating the fat off. Cardio Power and Resistance – This one targets the upper body with 40 minutes of strength training and power moves designed to build lean muscle and upper body definition. Cardio Max and Recovery – For 80 minutes once a week, you will use this DVD to get ready for the next round of power blasting workouts. Pure Cardio and Abs – 40 minutes of nonstop cardio that will blast your stomach muscles. Core Cardio and Balance – Another 40 minute easier workout that lets you take a breather before you start month number two. Max Interval Circuit – Uses MAX interval training to give you 60 minutes of the most intense workout you’ve ever had. Max Interval Plyo: 55 minutes of leg exercises that will push their limits until you feel like they may not hold you up anymore. Max Cardio Conditioning and Abs – 50 minutes guaranteed to push your limits with a cardio workout that will attack your abs too. 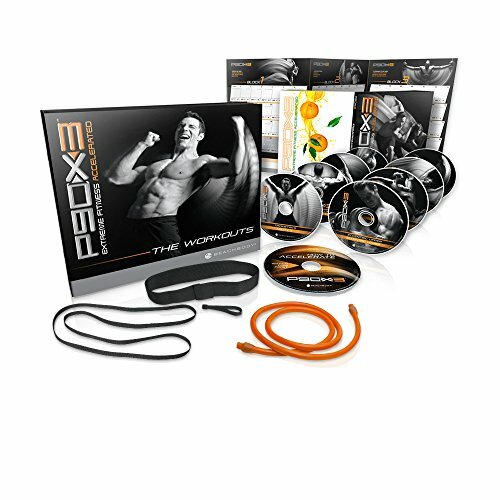 In just 30 minutes a day, you can get definition you’ve always wanted with Tony Horton’s P90X3 Base kit. You will enjoy unprecedented moves that bust your muscles on a daily basis and you won’t have to work out for hours at a time. These workouts are great for really challenging the user to push their limits and stick with a program that will get massive results. Included in the P90X3 workout are 16 30 minutes workouts, a Fitness Guide, a Nutrition Plan, Workout Calendar, “How to Accelerate” DVD and 24/7 support online. One of the things that make these exercise videos so popular is that there is a different workout every single day so boredom is a thing of the past. In only 25 minutes a day you will get an hour’s worth of results that really make a difference in your body. Shaun T’s theory, based on experiments he did, is that if you focus your intensity fir 25 minutes straight and you do it 5 days a week, you’ll get results you’re going to love and others will notice. Included in the Focus T25 Base Kit is 11 workouts that are on 9 different DVDs, a nutrition guide to help you plan your eating, ALPHA-BETA workout calendars, a 5 day Fast Track, a Quick Start Guide to jump start you on the program and start getting fast results, and a B-LINES Resistance Band. You’ll be all set to get started changing your health and your body and thanks to Shaun T’s excellent program, you won’t have to spend an hour or more to achieve it. Just 25 minutes a day, 5 days a week is all it takes to see major results. Cardio – 25 minutes of cardio that will have you dripping sweat. AB Intervals – Take inches of fat off your stomach with this cardio and abs workout that utilizes popular interval training. Lower Focus – This workout focuses on your lower body muscles and is geared towards raising your metabolism and burning fat too. Core Cardio – This cardio workout is all about getting ripped as fast as possible. Be prepared to sweat. Rip’t Circuit – Circuit training is very effective as this workout will show you.start with cardio, then upper body, legs, abs and repeat the whole circuit again. Dynamic Core – The effective workout has you standing AND on the floor putting your muscles through their paces. Upper Focus – Get the upper body you have always dreamed about with this upper body focus workout. Stretch – finish this series with a workout that stretches your muscles and helps solidify everything you’ve worked so hard to do. There are TONS of exercise videos on the market today and trying to decide which ones are good and which ones will just end up on the shelf unused. The three exercise video sets featured here are all on the top ten lists on review sites and customers love them. While they may not be good for every fitness level, they are challenging, they bring results and users love them. Exercise videos are probably one of the most purchased items when it comes to fitness. They are also one of the most likely to end up on the shelves of users due to many different reasons. In many cases, it’s because the user didn’t know what they were getting into when they purchased the exercise videos, so once they got them home and watched them, it turned out it wasn’t what they were looking for at all. There are many things a consumer can do to minimize unsatisfactory purchases when it comes to exercise videos. We have put together a buyer’s guide that will give you a lot of information on learning as much as you can about exercise videos and what they are about BEFORE you spend the money. When you are armed with this information you can be more assured that the videos you decide to purchase will actually be ones you use. What is your current fitness level? – knowing where you are fitness wise may be a hard thing for some to admit, but answering yourself honestly will ensure that you don’t start off with videos you may not even be able to keep up with not to mention finish. There is nothing more discouraging than getting an exercise video and then finding out that you can’t even handle their warm up. The most important thing to keep in mind is that just because you may be starting off at the very beginner’s level, you certainly don’t have to stay there. The more you exercise the stronger you will get and the more your fitness level will increase. It didn’t take over night to end up where you’re starting from so you shouldn’t expect yourself to fix it over night as well. What are your fitness goals? – Do you want to tone up? Lose fat and inches? Gain lean muscle mass? Maintain your weight? Reshape Your body? There are a number of fitness goals you could be interested in and many people have more than one, for example they want to lose fat and inches AND reshape their bodies. What your fitness goals are can determine the type of exercise videos that will fit those needs and goals the best. How much time are you willing to devote (realistically) to working out? – Another question that being brutally honest with yourself is necessary. Pretending you will devote 2 hours to working out every day isn’t practical unless you do that in some form NOW. Most people can’t keep up a two hour a day workout program unless they are professional fitness trainers or competitors. Exercise videos come in all lengths and intensity levels. Some are very short; others may be 60-90 minutes long. Knowing how much time you have to devote to working out will help you choose an exercise video that provides what you need in the time frame you have available. This will also encourage you to continue using it. Do you have any health or physical limitations to consider? If you have back problems, knee issues, arthritis, high blood pressure, asthma, or any kind of health or physical limitations, you need to consider these when looking at the array of exercise videos on the market. There are some that will push you to the very edges of your limits and others that can accommodate a necessity for lower impact and a slower pace yet are still effective. Ignoring health problems or physical limitations is very dangerous. Asking your doctor for any restrictions before shopping is a plus as well. What type of exercise do you enjoy? – Do you love to dance? Do you like ballroom moves or hip hop? Do you enjoy martial arts inspired moves like kickboxing? Do you prefer walking? There are so many varieties of exercise videos available that you can find many that cater to the type of exercise you like to do. Don’t get locked into only one form though because learning something new can keep you from getting workout burnout. This is one of the reasons a popular exercise series called P90X3 is so popular. Every day you will have a new form of exercise to look forward to. How much space do you have to exercise? – Do you have plenty of space to move around freely without hitting or running into anything? If you get kickboxing style exercise videos will you be able to follow the moves without taking out a living room lamp? Knowing how much space you will have to work out will help you match the exercise videos your purchase to the space you will be using to watch them and follow along. Do you want low, medium or high impact workouts? – Impact is important when it comes to how intense you workout is. Do you need or want low impact or do you want to really take it up a notch (or several) and get a challenging workout that will have you begging for it to be over? Most exercise videos will give you information on what kind of impact you will experience by doing it. These are just a few of the vast number of categories available. It would not be hard to find even more with a simple internet search inserting the type you were looking for along with “exercise videos”. This is one of the reasons exercise videos are so popular. They work for every age, fitness level, shape, size and preference out there. Now that you understand the vast amount of categories available to you, you can start narrowing the field of choices down by looking at the specifics of exercise videos and deciding which ones will be something you will not only enjoy but continue to use long term. If you are starting out as a beginner to exercise, then you should expect to upgrade your exercise videos as your fitness levels increase. You don’t have to stay with a beginner video when your fitness level advances to intermediate or advanced. Below are some factors to look at when looking at individual videos. The Instructor – This is one of the most important factors of your exercise video. If you don’t like the instructor, it will eventually irritate you enough to stop using it. Look for instructors that motivate you to work harder and push harder not work to end the video so you don’t have to listen to them anymore. It’s a plus for the instructor to actually have a fitness background of some kind, which is both for your safety and to give you the knowledge that the video has legitimate foundations in real fitness rather than just being something they did on a whim or for celebrity endorsement. If you don’t want to have to get any additional equipment, look for the exercise videos that don’t require anything extra. (There are plenty available) If you don’t mind buying the extra equipment, look for the videos that utilize equipment that you enjoy using and can use physically. Length of the Workout – How long is the workout on the video you are looking to get? If you want to work out 30 minutes a day, getting an exercise video that is 60 minutes long will only cause frustration. Most people don’t want to do half a workout and since they are designed to include a warm up, workout and cool down, only watching half gives you an incomplete workout. What is the Level of Difficulty? – Exercise videos should specify whether they are for beginners, intermediates or advanced exercisers. Be honest with yourself when looking at the choices available and choose one that will be a good starting point. If there is a series of video, look for sets that have a progression level as your fitness level improves and increases. If you notice words like high intensity, fat blasting, sweat producing and similar phrases, you can almost guarantee that the video is for intermediates at the very least and probably more suited for advanced users. The reason you want to start off slow is so you don’t get burned out the very first time you struggle through it. This doesn’t mean don’t challenge yourself, it just means start off with something you can have success in finishing and build on that success. What Does the Workout Focus on? – This goes along with matching the exercise video to what you want to work on in your fitness goals. Make sure the exercise video you choose will help you reach the fitness goals you have. For example, if one of your goals is to work on getting flatter abs and there is not an abs exercise on the whole video, this is a major fitness goal that goes untouched. With the variety of exercise videos on the market today, you will be able to find an exercise video that helps you reach your goals. Budget IS Important, But… – It’s always a good idea to have a budget in mind when it comes to buying anything, but don’t look for the cheapest exercise videos on the market. The adage you get what you pay for is definitely true. That doesn’t mean to spend way over your budget either. The point of this particular tip is that you should look for good quality videos and keep your budget in mind as well. Not all inexpensive videos are bad of course, but buying simply from a price point can quickly add up to nothing but a collection of dusty, unused exercise videos on your shelf. When you go to purchase an exercise video, check the description to see if they offer anything else along with it. Many videos come with nutrition plans, workout calendars or journals, quick start guides and other bonuses that help the user get the most from their purchase. Some exercise videos have access to online tools as well such as websites and support forums that users can participate in. Don’t let the bonuses overshadow the importance of the video being what you want and need, but having these extras is always a nice bonus. Reading customer reviews and comments is an excellent way to get some insider information about the exercise videos that you are interested in purchasing. These reviews are mostly given by people who have actually purchased the product in question and have given it a review and a star rating. Really pay attention to what these customers are saying. You can learn about what they liked and what they didn’t like. Even though not every customer is going to like every video they get, most people are honest about what they loved and didn’t love. Amazon is an excellent place to get these reviews and comments and check out the videos you are interested in. Many exercise videos will make unrealistic guarantees in terms of the results you can expect to see. Beware of these because they can set you up for a real disappointment. A good example of this is a program that claims you can get “ripped” in 30 days. Well, this might be true IF you are only toning up and don’t have weight to lose. For anyone who has got pounds to lose, they finish the 30 days and are still not “ripped” because those claims did not apply to anyone who has weight to lose. If you don’t have any way to preview some of the video and you want to get it anyway, make sure there is a satisfaction guarantee and a return policy that allows you to get your money back and return the video if you are not happy. This will also prevent you from gaining a collection of videos you won’t use because you didn’t like them. There are tons of exercise videos for sale on the market today. That makes finding one that you will enjoy and use both overwhelming but entirely possible since so many are out there. Following the information in these exercise videos buyer’s guide will help you narrow down your choices based on your needs and fitness goals and choose one that you will enjoy and benefit from as well. Knowing what to look for is the most important step in making the right choice for your needs. With so many styles and choices available you can even decide to buy several so you have a good variety to choose from. Boredom is one of the biggest reasons people stop their workouts, so giving yourself choices can alleviate this problem completely. Once you make your choices you can get down to business reaching your fitness goals and improving your health.